JALALABAD ( PAN ): The long-oppressed Sikhs on Wednesday began celebrating Vaisakhi, the holiest day on their religious calendar, in eastern Nangarhar province, where thousands of minority families have been forced into migration over the past three decades. Of the 37,464 Sikh families living in the eastern region before the civil war began, only 400 are left in five provinces, with 84 households internally displaced. The community began the three-day festival in the Sultanpur area of Surkhrod district. Dozens of devotees are expected to throng the two temples in Jalalabad on Thursday to listen to recitation from the Guru Granth Sahib. A Sikh elder, Royal Singh, told Pajhwok Afghan News that Vaisakhi — a day steeped in tradition –marked the birth of the Khalsa (Pure Ones), the brotherhood of Sikhs committed uprooting evil, fighting tyranny and defending the weak. The day was first celebrated in 1699 when Guru Gobind Singh, the 10th Sikh Guru, baptised his followers with Holy Amrit, nectar of life. Singh recalled Guru Gobind Singh parted ways with Hinduism and founded a new religion, Sikhism, 313 years ago to start worshiping one god, instead of many idols. New Delhi: His long beard and meticulously tied turban make it hard to distinguish Balwan Singh from any other Sikh in the country—until you get to peek into his living room or know that his mother tongue is Pashto, spoken predominantly in southern Afghanistan. Balwan Singh was 25 when he fled from Afghanistan following the December 1979 Soviet invasion of his country. More than 30 years since, he continues to live in New Delhi as a refugee. 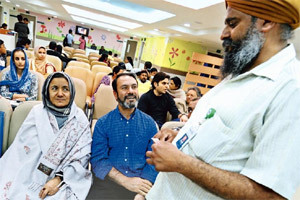 Service with a smile: Balwan Singh (right) works as a translator with Apollo Hospital. Photo by Priyanka Parashar/Mint. More Afghan nationals in India moved to the country in the 1990s with the emergence of the extremist group Taliban as a political force in their country. This reached a flashpoint in 2001, when the US began military attacks on the Taliban in retaliation for their support to the militant group Al Qaeda that had masterminded the 11 September attacks on the US that year, killing thousands of Americans. According to the Delhi Police, in the Capital there are around 9,000 Afghans, many of whom stayed back illegally beyond the permitted period. The United Nations High Commissioner for Refugees had 16,400 refugees and some 5,300 asylum-seekers in India registered with it as of 31 August 2011, comprising mainly Afghan, Myanmar and Somali nationals. Singh’s residence, about 10km from Tilak Nagar in West Delhi, is surrounded by about 50 families, all refugees from Afghanistan living in slum-like conditions. The first noticeable feature of his house is the absence of any furniture. Instead, a carpet stretches to the corners of the room. Guests are invited to sit and dine on the floor. Singh says his family still remains influenced by Afghan traditions such as this. And unlike the fun-loving Punjabi community in India, the Afghan Sikhs are restrained and their women stay inside the confines of their homes. There are other similar Afghan ghettos in the Capital—in Bhogal, Lajpat Nagar and Malviya Nagar. Many of the families in these settlements run grocery shops or Afghan restaurants or work as cooks and auto rickshaw drivers. Singh did these jobs until early 2000. Today, he has a better job, ironically because of the instability in his homeland. Singh works as a translator with Apollo Hospital, which is receiving an increasing flow of patients from Afghanistan. Among the patients for whom Singh works as a translator is Mohammed Omar Khayani, a director at the ministry of rural rehabilitation in Afghanistan. “Healthcare in Afghanistan is very poor. 80% of laboratories and medicines are fake. So I come here every six months,” says Khayani. Apollo Hospital, like many other speciality hospitals in the Capital, receives nearly one-third of its overseas patients from Afghanistan, according to a hospital spokesperson. In the past year, the hospital treated around 1,250 Afghan patients. The thriving medical tourism is supporting Afghan immigrants in New Delhi. Four airlines—Air India, Kam Air, Safi Airways and Ariana Afghan Airlines—fly daily between Afghanistan and India, bringing about 800 people daily. As the flights land at the Indira Gandhi International Airport in New Delhi, between 1pm and 5pm, a large number of Afghans take position outside the exit gates in the hope of finding a customer. Like Khayani, most of the visiting Afghans are not familiar with any language other than their own. Singh assists Khayani with his daily needs in India, from explaining his medical condition to the doctors to taking him to the foreigners regional registration office in Delhi. At the airport exit gates are also policemen in plain clothes watching the Afghan immigrants. Afghans are under the constant watch of various law enforcement agencies that see them as a potential security threat. The police visit hotels and hospitals across the Capital seeking information on Afghan immigrants and their whereabouts. At the airport, these undercover policemen randomly pick Afghan nationals on suspicion of them being touts or unauthorized guides. Sayed Basher Kazemi is president of the Kazemi Construction and Road Building Co., which builds roads in Kandahar, one of the most turbulent regions in Afghanistan. In Kabul, he says, he lives in a palatial house with his family of 60. But he comes to India every once in a while to escape the frequent bombings and militancy in his country. “We have Taliban. We have Pakistani Taliban and also Irani Taliban, American Taliban and UK Taliban… UK Taliban killing American people, American Taliban killing English Taliban, ISI Taliban killing police. We have a lot of Taliban,” says Kazemi, explaining his frequent trips to the “very liberal” India, where he also comes to meet his Russian girlfriend.